Stainless steel squat pan manufactured by Franke South Africa. Available in 700 x 700 mm OR 740 x 740 mm sizes. Unit to be manufactured from Grade 304 (18/10) Stainless Steel ,1,2 mm gauge with the foot plate and flush bowl pressed into one piece. The foot plate tray to be pressed in raised pattern on both sides and in front of the flush bowl. 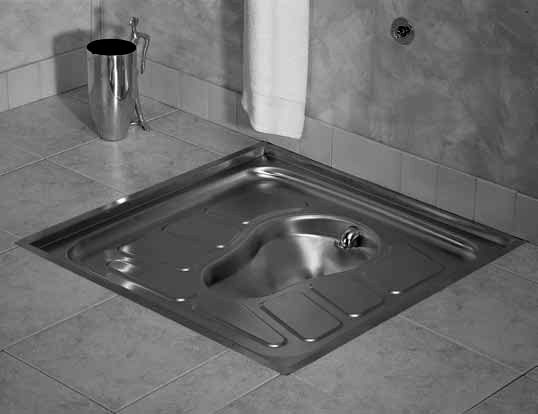 The Stainless steel squat pan to be fitted with a rear entry flushing spreader that will self seal with 38 mm or 41 mm flushing pipe (please specify), waste outlet with a 110 mm external diameter, suitable for fitting to a standard 110 mm PVC or cast iron waste connector. Also available with High level Stainless Steel cistern with Supa Flush Valve and 41 mm diameter Stainless Steel flush pipe.